We are always happy to make recommendations on where to play golf, where to dine, where to dance, where to shag, go shopping and even watch the big game. You can ask our drivers and they will tell you where the locals go. We can take you to the hottest places at the beach that attract over 15 million tourists to the Grand Strand Area year after year. We have picked out some business and places for you to consider here on our website. Occasionally,these places may make changes. If you find one of these links below not working or the place closed, we apologize ahead of time. Depending on the time of the year, some of the places may be closed for the season. We recommend calling the place of business or call us if you are unsure. We will tell you what we know! They say that the Myrtle Beach Area is home to over 3000 places to eat. We have tried a lot of them. We provide this list of some of our favorites. 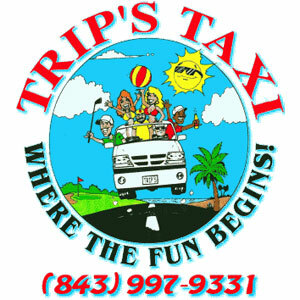 Give us a call at 843-997-9331 and we will be happy to pick you up, drop you off and take you wherever you want to go next. Give us a call at 843-997-9331 and we will be happy to pick you up and take you wherever you want to go next. Coming to the beach by boat? Maybe you are heading to the Marina for a fishing trip or some Watersports. Let us get you there and back SAFE! Let the Fun Begin with Trips Taxi service. Most of the golf courses in the area offer tee times to the public. There are a few private clubs that are members only. Here is a list of some of our favorites. If you are coming during the peak of the golf season, you may want to arrange your tee times way ahead of your arrival. Of course, if you can afford to wait, last minute deals can save you a lot of money – Let us pick you up at your hotel or vacation rental and shuttle your entire golf group to the course. Call us 843-997-9331! Give us a call at 843-997-9331 and we will be happy to pick you up, drop you off at the club and take you wherever you want to go next. Of course the clubs listed above are good places to party. Here is a list of bars that might offer some dancing too. Call us 843-997-9331 and we will be happy to get you there and back SAFE! Let us be your DRIVER and let the Fun Begin!